Popular UK actor James Gaddas, best known as Governor Grayling in Bad Girls and Vinny in Coronation Street in the UK, as well as starring roles in the musicals Billy Elliot and Mamma Mia in London’s West End, is returning to DUCTAC next week with the award winning Canadian musical, ‘Billy Bishop Goes To War’ after a well received run earlier in the year. RAW Theatre Company will again be producing the show following their hugely successful version of ‘Cyrano De Bergerac’ at DUCTAC recently. The show features Gaddas playing 18 characters in a rousing, uplifting, and poignant depiction of World War One flying ace Billy Bishop’s life story. Accompanied by Bradley Minchin at the piano, this is a fast paced, and highly entertaining theatre piece, which will appeal to all. Billy Bishop Goes to War will open as a red carpet invite only event on the 26th of November. Public Shows will run at The Kilachand Studio, DUCTAC from Thursday 27th to 29th November at 8pm, with an additional matinee show Saturday 29th at 3pm. Tickets are available at 150AED for evenings, and 120AED on the matinee. For more information and to keep up to date with the show’s news, visit Raw Theatre Productions on Facebook or @RawTheatreDubai on Twitter. Tickets available online at: https://ductac.etixdubai.com/ Or by phone on: 04-341-4777. Raw Theatre Company is a professional theatre production company from the UK, managed by brothers Chris and James Gaddas (the latter a renowned UK television and West End star). James Gaddas is one of the UK’s most versatile actors. In a career spanning 30 years, he has played roles in TV series such as ‘Bad Girls’, ‘Coronation Street’, and ‘Medics’ and on stage in the West End in ‘Mamma Mia!’, ‘Spamalot the Musical’ and ‘Billy Elliot’. Having first performed the piece as a young actor with The Royal Shakespeare Company, James was delighted to find that a revised version had been developed by the original author, from the perspective of an older Bishop. 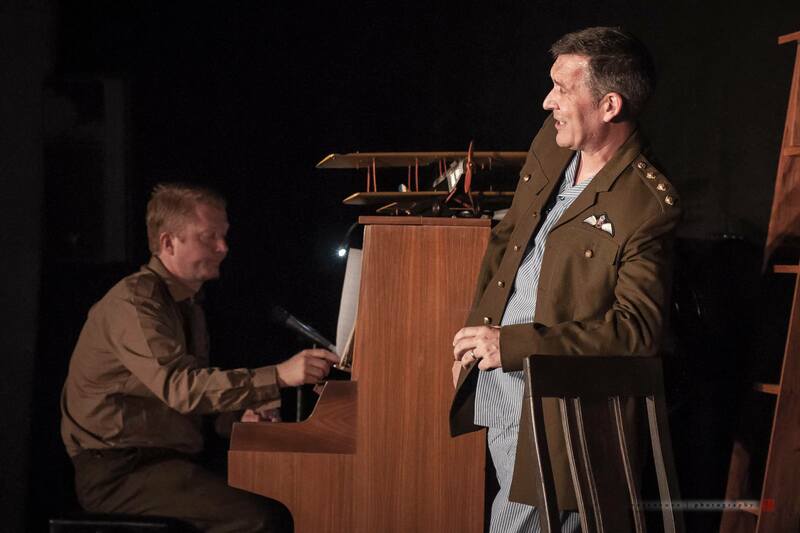 With James playing eighteen roles in a fast paced depiction of a pilot’s life in World War One, ‘Billy Bishop…’ is a show laced with songs, wit and comedy, yet one that at the same time has the capacity to move us in its depiction of a conflict that resonates, even in its 100th anniversary year.